It is the weekend again. Time really moves fast when you travel 50% of the time. I suppose I don't have to travel nearly this much, but I do find it the most cost effective way to do my job. Being away from my apartment so much I have learned a few techniques. I buy a lot of freshies. What do you do with the freshies when you are leaving for two weeks? Also, I don't have a compost pile here, like on the farm. The organics need a purpose. So, what I do is take all my veggie scraps, you know the stump of lettuce, the stem of tomatoes, the pepper that would go to waste, and I freeze them. Then when I have a day or so here I take the frozen stuff out and make a wonderful vegetable stock. You make vegetable stock by getting a big ol' pot and dumping in all the frozen stuff, nothing putrefied, and adding lots and lots of water. You then slowly cook (not boil) over low-low heat for at least 12 hours, more is better. Do not add any salt. Strain the broth and freeze in baggies. Freezing is an important step in making any good stock. The stock is great for soups or fish sauces, excellent base for almost anything, maybe "Vegetable Stock Ale." I definitely regret the list of my favorite music both times I have listed it on my blog. It always gets me thinking. Classical music rose to the top after Venice/Austria/Munich. Next time I go to Venice I am unquestionably going to an opera or a classical music concert in Venice. I am off to Brazil Sunday. I am traveling with a lot of my co-workers which is very unusual. That will be good for a laugh for sure. Since they are traveling as much as I am (or more) alone. We all have our own "travel style." DJ and I are planning this year's vacation. Go ahead, see if you guess what country. Of course, it will be a new country. It should be exciting. Adventure. 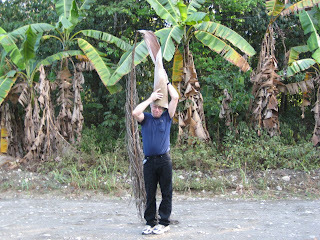 Here is a pic from Zancudo Costa Rica in 2009. This is traditional jungle headdress for my people.